You are here: Home / Events / Events Archive / 25th ADA Celebration / Events & Activities / Commemorative Posters / A growing inconvenience? A purple flower on an orange and green background. 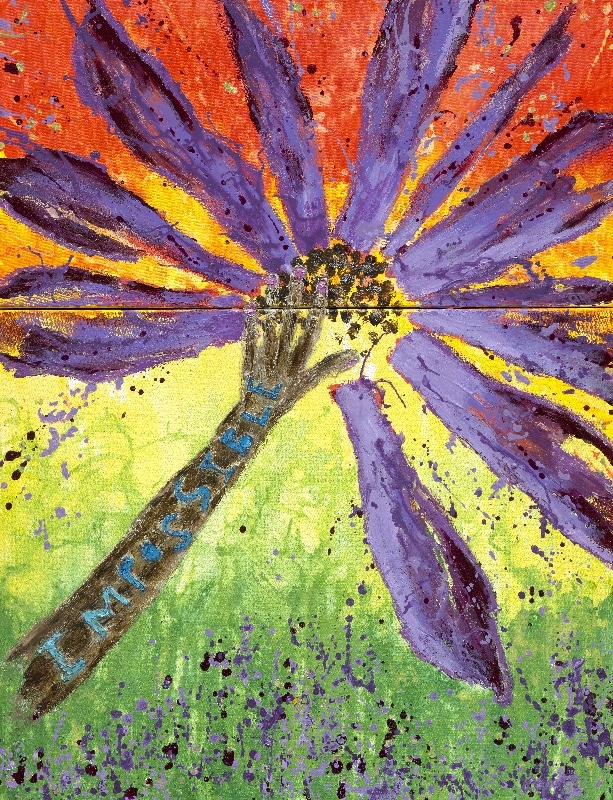 The stem of the flower is a hand and arm with the word “impossible” written on it. ‘A growing inconvenience?’ is my interpretation of what it means to live with a diff-ability. My hand reaching across two canvases represents the divide between those who are considered ‘normal’ and those who live with disability. It is my hope that this piece continues the conversation as to what diff-ability means and how we can move towards growing a beautifully inclusive world! My name is Annie Young. I started to lose my eye sight over 10 years ago. Initially, I thought I would have to surrender my gift as a creative. Fortunately, I had a dear friend who was resilient in her efforts to help move me in the direction of my dreams. Over time, I discovered a means in which I could bring to reality that which visited my minds-eye. My work is inspired by: dreams, music, memories and faith. When words escape me, I paint. I can feel my spirit becoming restless if I miss a day in the studio. The act of creating offers a sort of therapy…meditation. In moving the paint under my fingers or experimenting with new techniques and products, I find myself able to breathe through difficulties and celebrate successes. I continue to challenge myself by experimenting with new techniques, products and ‘rules’ of color. Please, p-l-e-a-s-e! do not refer to me as ‘disabled’! I don’t know about you, but I don’t appreciate being “dis’d”! I prefer the term ‘diff-abled’. I believe this ‘label’ (if we must use them at all) offers a more inclusive and accurate assessment of my person. “a growing inconvenience?” is my creative interpretation of what it means to live with a disability diff-ability. Over a decade ago, I started to lose my eyesight. In time, and with the help of rehabilitation professionals, family and friends, I realized that I could continue to enjoy a full life despite my diff-ability. More challenging than navigating a world as a person with limited vision has been navigating a world with persons of limited vision. I wanted this piece to speak to a number of issues. I used the symbolism of color, subject and texture to share the message of: harmony (blue), knowledge (purple), optimism (yellow), enthusiasm (orange), passion (red), service (green) beauty (cosmos flower) and in-depth study (working with paper). My hand is reaching across two canvases to represent the divide in our culture between those who are considered ‘normal’ and those who are living with a disability. I intentionally painted my fingernails to illustrate I’m ‘normal’ too. The divide is not necessarily obvious to the eye, but it most certainly can be felt. In the reach of my arm/hand I have included the words, “I m Possible”….many may see the word IMPOSSIBLE. This would speak to how differently things can be perceived. The color blue represents a balance of harmony and peace (internal and external) towards understanding what it means to live with a disability and what can be achieved as a collective community. I painted the beginnings of a cosmos flower. In the Greek language cosmos means ‘beautiful’. The beauty of our world is not in what we see, but in the intentions offered one another. The petals began with the color orange to symbolize the enthusiasm and energy in achieving the passage of the ADA. I painted over the orange petals with various hues of purple paint to symbolize the growth in knowledge about persons living with a disability. Over the past 25 years, the ADA has been revised and amended to reflect the needs of those identified in the bill. The ten petals are a reminder things are not perfect, not complete, but a work in progress. The watery background represents fluidity in attitude and laws surrounding this subject. I worked with paper not only as a means to navigate the surface but to symbolize an in-depth study of the subject. The name of the piece is derived by the historic ‘Capital Crawl’. History reflects there were many disability rights activists having disregarded their wheel chairs and crutches to either crawl or pull themselves upwards over the 100 steps of the Capital prior to the act being passed. This spontaneous and collective effort reportedly ‘inconvenienced’ a number of senators and prompted them to pass the bill. It is my hope that this piece continues the conversation as to what disability diff-ability means and how we can move towards growing a beautifully inclusive world!